Central Selection Board of BTC, Kokrajhar has issued another recruitment notification in the month of November 2017. You can find the 1st CSB BTC Kokrajhar Recruitment 2017 in this link. 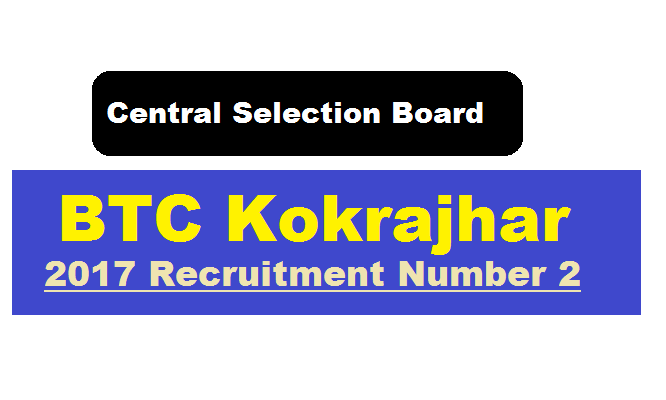 According to the second Central Selection Board BTC, Kokrajhar Recruitment 2017, The Central Selection Board (CSB), Bodoland Territorial Council (BTC), Kokrajhar invites application from the eligible candidates for filling up the posts of Health Educator/ NMA/ Computer lying under the Department of Health & Family welfare Deptt, BTC including Model Hospital in the pay band and Grade pay plus other allowances as admissible under the Rules of Govt. of Assam issued from time to time. Educational Qualification: Candidates must be Graduate in any stream from any Govt. recognized University. Educational Qualification: Candidates must be HS passed in any stream. Educational Qualification: Candidates must be HS passed in any stream and 1 (one) year Diploma in computer. Age Limit : 18 to 43 years (Relaxable to SC/ST candidates as per Govt. norms). Interested and eligible candidates willing to apply for the posts as mentioned above may apply by filling up the application from as per Annexure-I of the Official advertisement below. The candidates who are in Govt./ Semi Govt. service or public undertaking or such other similar organization/ corporation/ Board/ Bodies must apply through proper channel and should ensure the receipt of his/her application in the Board’s office with the stipulated date of receipt of application failing which his/her candidature is liable to be reject. No advance copy of application shall be treated in valid for determination of eligibility of candidates. The completed application form duly filled up by the candidates with testimonials should be submitted to the following address. ii) Rs.100/- for SC/ST candidates. 1/ Candidates from BTC area only need to apply. 2/ The reservation will be as per sixth scheduled norms. 3/ The last of receiving application is fixed on 01.12.2017.